Ruanna has been a Professional Member of the Tarot Guild since 1995, member number P92. 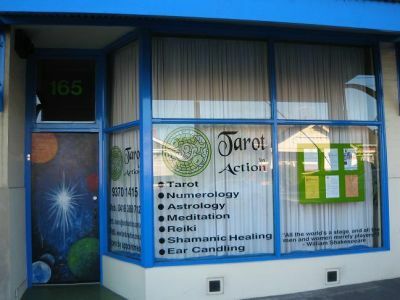 A Professional Member of the Australian Psychic Association since 1998, and Professional Member of the Australian Reiki Connection Inc. Ruanna has adopted the guidelines from the TGA, APA and the ARC for her Tarot in Action practices. The purpose of this code is to establish and maintain standards for Tarot practitioners who are members of the Tarot Guild of Australia, and to inform and protect members of the Tarot Guild of Australia, and to inform and protect members of the public seeking and using their services. All members of this Guild are required to abide by this code. They thereby accept a common frame of reference within which to manage their responsibilities to clients, colleagues, members of this Guild, and the wider community. This code aims to provide a frame work for addressing ethical issues and to encourage optimum levels of practice. The practice of Tarot is a non-exploitative activity. Its basic values are integrity, impartiality, and respect. The practitioner's role is to facilitate the client's journey in ways which respect the client's values, personal resources, and capacity for self-determination. Practitioners should take the same degree of care to work ethically whether their services are paid or voluntary. • To uphold the integrity of the Tarot as an enduring source of wise counsel, spiritual guidance, and as a pathway to self knowledge. • To remain open to the acquisition of new skill. • To take all reasonable steps to monitor and develop their own competence and to work within the limits of that competence. This includes having appropriate and ongoing supervision and/or consultative support for their work. • To pursue their own personal development. • To maintain their own effectiveness, resilience, and ability to help clients. • To monitor their own personal functioning and to seek help and/or withdraw from the practice of the Tarot, either temporarily or permanently, when their personal resources are sufficiently depleted to require this. • To conduct themselves in their Tarot-related activities in ways which elicit public confidence in their role as a practitioner and in the work of other practitioners. It is not appropriate to undermine the work of others. • To discuss problematic readings/clients, should the need arise, with a trusted colleague, adhering to the principle of client confidentiality. • To adhere to the policy that all official or legal statements concerning the Tarot Guild of Australia must come from the President after s/he has consulted with the Committee of Management. • To treat confidentially all personal information about clients, whether obtained directly or indirectly by inference. • To ensure that discussions about particular consultations within supervision and teaching take place without revealing the client's identity. • To be responsible for communicating accurately the terms on which their services are being offered (eg. availability, confidentiality, fees, cancellations, and any other significant matters) before the consultation takes place. • To inform the client of the interpretive nature of the Tarot and ensure that they understand the power of their own free choice. • To have as first priority the well being of the client, to endeavour to enhance the client's self understanding, and to inspire hope and courage. • To use the Tarot for the empowerment of others, i.e., to work in ways which promote the client's control over his/her own life, and to respect the client's ability to make decisions in the light of his/her own beliefs and values. • To refrain from imposing personal judgements and prejudices during consultations. • To recognise their inability of unwillingness to work with a client and make appropriate referrals. • To respect, support, and encourage fellow members in their pursuit of Tarot wisdom. The Committee of Management reserves the right to assess the professional behaviour of members when called to question. A formal procedure has been developed. Members of the Tarot Guild of Australia accept and abide by these guiding principles. Professional Members are required to sign a statement indicating their willingness to do this when they acquire their Professional certification.